And, we’re back. Again. After a week, I’ve recuperated enough to write about my second Anime Expo. Contrary to my first AX last year, I didn’t experience the culture shock of being surrounded by thousands of other anime fans. I didn’t feel nearly as out-of-place as I did last year. Surprisingly, this included my trip to the Maid Cafe, which was really quite fun and entertaining, and not the huge awkward-fest I had envisioned. The hosts and maids there were quite good at what they did, and I had a lot of fun. Also in contrast to my visit last year, the industry panels at AX09 were relatively uninteresting. None of the companies I saw announced anything significant; significantly, no one announced licenses for Toradora! or Eden of the East. Hopefully, something good will happen with these series soon. The culturally-oriented panels I attended were much more interesting this year. The OP/ED panel was especially entertaining, and while the VOCALOID panel was not exactly what I was expecting, it was also very cool. Last year, I found panels like these to be underwhelming, but this year they were quite good. I spent a lot more time in the Exhibit Hall this year than the last; this was in part due to my increased budget, but also because the booths were more fun to hang around. While Funimation was the only major publisher with a presence this year (I’m not counting Crunchyroll), some of the smaller shops had awesome booths. Hen Da Ne!, Rockin’ Android, and PM Studios (with mydjsobad!) were three amazingly cool booths to just chill near, and chat with the people around (as well as having cool stuff). Moreover, Kinokuniya bookstore had a booth at AX this year, which meant someone actually sold a decent variety of CDs. I suppose now is as good a time as any to point out what I bought at AX. Power Slam by DJ Shimamura, the DJ MAX Trilogy Soundtrack (both T and R discs), and the DJ MAX Technika card (see my music blog for more about Technika) came from the PM Studios booth, while I picked up Suguri from Rockin’ Android directly. 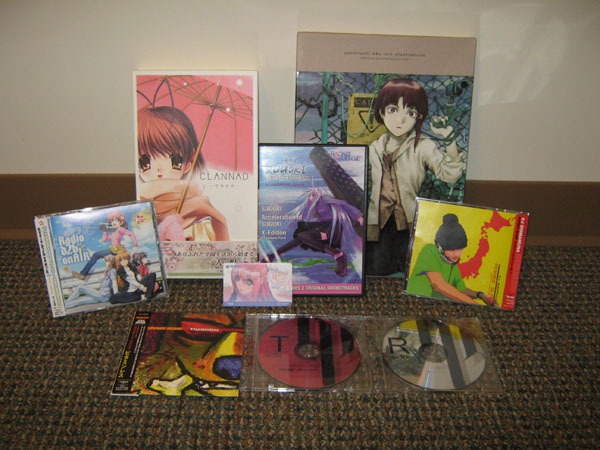 The Lain artbook came from DMP, while I got Clannad from Hen da Ne! One of my friends gave me the Radio b2b on AIR CD; he took the poster instead. 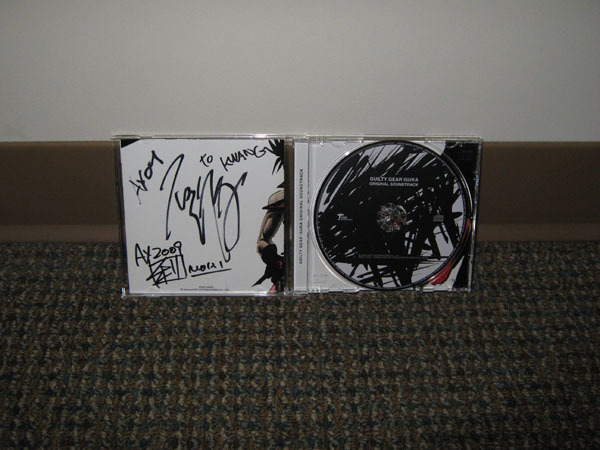 The other major event of AX2009 was meeting Daisuke Ishiwatari. I’ve been a huge fan of the Guilty Gear series of fighting games, along with their soundtracks. As such, I’m a huge fan of Daisuke Ishiwatari, the man behind both. I was ecstatic when I heard that he’d be attending Anime Expo, and bought a copy of the Guily Gear Isuka soundtrack to get signed by him at the con. Unfortunately, the first signing session was cut off before I could get in (but after I’d waited for an hour in line). The second session, the following day, had an even longer line. However, after nearly three hours, I was able to meet both Daisuke Ishiwatari and Toshimichi Mori, one of the directors of the Guilty Gear and BlazBlue games. Both of them looked weary when I saw them, but they get a huge amount of respect from me for making so many of their fans happy that day. That’s about it. I’m planning on going back again next year, as well as going up to Fanime. Hope to see you then!